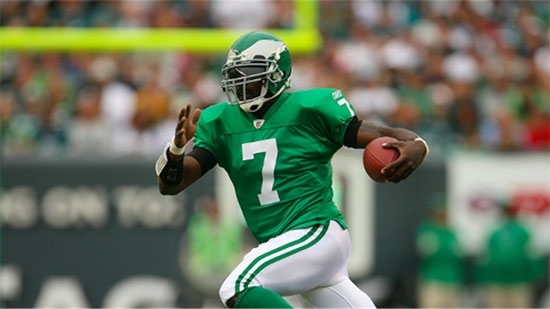 Philadelphia Eagles owner Jeff Lurie talked Tuesday night at NFL league meetings in Arizona about his desire to bring back the Kelly green uniforms in some form. "I want to see us use Kelly green as our alternate and Thursday night type of uniform," he said at the league's annual meeting Tuesday. "And the only thing blocking us is we can't use the Kelly green helmet yet. So that's what we're waiting for. We're going to keep pushing at it." Last week, the Eagles filed a proposal to the competition committee to allow for teams to have an alternate helmet. Current rules allow for teams to have only one helmet. Pairing the midnight green helmet with Kelly green uniforms wouldn't look too great. The Eagles pulled the proposal back after determining it wouldn't pass this year. Lurie says they'll keep pushing. The Eagles did wear the full uniform to open the 2010 season to celebrate the 50th anniversary of the 1960 NFL Championship team. West Philadelphia High School was partially evacuated this morning when a cell phone started smoking. It happened in a third floor classroom at the school at 4901 Chestnut Street. The phone fell from a student's desk and started to hiss. The student kicked it away and it then started to smoke. The third floor of the building was evacuated. The Philadelphia Fire Department quickly placed the situation under control. No one was injured. No word on what type of phone it was. Students returned to class. Two former aides to New Jersey Governor Chris Christie will be sentenced today for their roles in the Bridgegate scandal. 45-year-old Bill Baroni was sentenced to 2 years in prison. 44-year-old Bridget Kelly will be sentenced later this afternoon. Both were convicted last November of all counts including wire fraud, conspiracy and misusing the bridge for improper purposes. They were accused of closing lanes of the George Washington Bridge in 2013 to cause traffic problems as political retribution for the Democratic mayor of Fort Lee, NJ, for not endorsing Christie's re-election. Kelly was Christie's deputy chief of staff and Baroni was a Christie appointee to the Port Authority. Christie himself was never charged and denies any knowledge of the conspiracy. UPDATE:Bridget Kelly was sentenced to 18 months for her role in Bridgegate.